So, you’re thinking about renting a car 🚘 in the UAE? And why shouldn’t you, the advantages 😀 are boundless. However, firstly, it is wise to consider certain traffic regulations for the best of your experience. After all, you wouldn’t want to end up in complexities. Without further ado, let’s read about some of those regulations to set you right for a brilliant car rental Dubai experience. Having a valid driving license is a must for anyone whether he or she is a UAE resident or a tourist. Residents can apply for a driving license and get one by clearing a driving test or converting their home country’s driving license (if applicable). A copy of your Emirates ID is also required. Tourists can drive on their home country’s driving license (if applicable, see list here) or they’ll require an international driving license together with their driving license. A copy of their passport and visit visa page are also required required. A security deposit is secured by the car rental company as protection against any car damage or traffic fines. Depending on the model of the car, you will pay a certain amount between AED 1000 and AED 10,000. The deposit amount is returned after deducting additional charges in 15-20 days after the car is returned at the end of your rental period. Some companies accept cash as security deposit, however it is not recommended by the RTA (road and transport authority) Dubai. It’s always best to provide the security deposit as “pre-auth” by credit card as your bank offers protection in the form of insurance against unlawful charges. Also since it’s pre-authorized, the money is simply held for 15 days by the car rental company and automatically released if no extra charges are incurred. So be sure to provide the security deposit by credit card 💳 to the car rental company. Besides if you’re a tourist, getting the cash back to you in your home country is somewhat tricky. International bank transfer or money transfer comes with currency conversion charges which will be borne by you. It’s also an inconvenience on the part of the car rental company so it might take even longer. In the UAE, there are different age limits for different vehicle groups. For heavy vehicles, you need to be atleast 25 years old. For light vehicles, you can drive in the UAE once you’re 18 years old but that’s applicable only for residents driving their own vehicle. To rent a vehicle, you must be 21 years old or above. The age limit is important as auto insurance companies do not insure rental vehicles driven by persons below 21. So if you’re aged below 21 and wish to drive a rental car in the UAE, shop around. Certain car rental companies are linked within insurance companies that do provide cars to those below 21 years old for an additional fee. You can drive a rented car only within the boundaries of the United Arab Emirates. However, there are some companies which do allow you to drive down to Oman and Saudi Arabia as they have branches there. Though, you need to acquire permissions and documentation beforehand. Taking a rental car outside the UAE is strictly forbidden and could get you in unprecedented trouble such as a hefty fine or even a jail sentence. Renting a car in UAE may amount to additional payments, fines and charges. Don’t worry, however, these will only be liable should you incur them. Don’t break any rules, don’t pay. Salik – If you cross tolls, you’ll be charged AED 5 per Salik (toll charge). This is calculated when you return the vehicle by rental car company. Luxury, sports and exotic cars come with free salik unless the total usage is exorbitant. 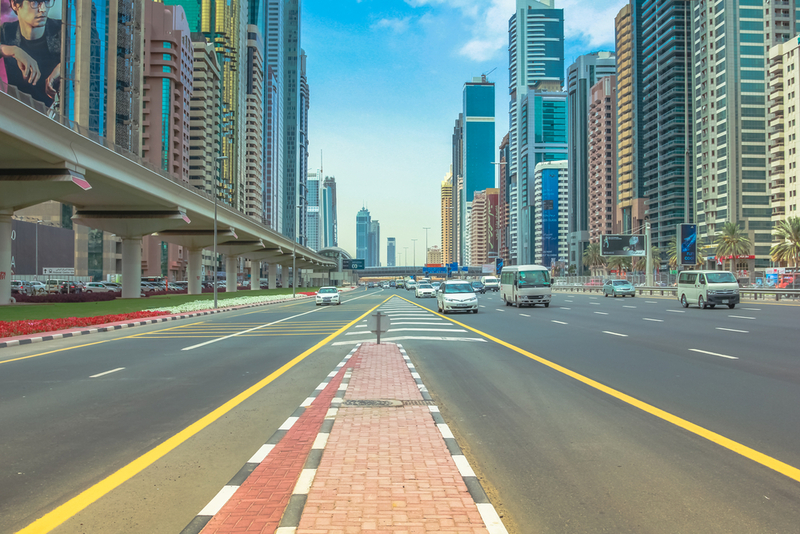 Traffic Fines – The roads in the UAE are heavily monitored by speed radars, traffic signal sensors and security cameras. Be vary of the traffic laws and norms. Breaking any traffic rules could attract heavy fines. You will be charged with these by the rental company at the end of your trip. Not sure if you got a fine? You can check for RTA Dubai fines here. Damage – At the time of delivery, check for existing dents and scratches if any – it’s best to shoot a video circling the car. Share it with the car rental company driver / manager at the start to avoid any misunderstanding at the time of returning the car. All car rental companies are to offer collision damage waiver in the UAE. The cost is inclusive in the total rental price but the norms differ emirate to emirate and even car rental company to company. As the name suggests, this coverage includes any damage to the vehicle provided it occurs without your fault. You need to get a green slip from the Police as proof. Renting a car in UAE can be hassle-free only when you consider the recommendations stated above. We believe in making your experience flawless, so please feel free to contact us should you have any questions or rental requirements.